When we take a peek into the basics of Energy Astrology, we’ll have a new way of observing our natal chart, one that allows us to recognize blockages and possible problems with the flow of energy inside our etheric body that we thought were elsewhere. Observing our chart, we get inside information for our energetic body, and we can see with more clarity where the nod is tied that needs to be worked on. Astrology will bring clarity as we connect the dots and see how its basic symbolism connects to our energetic body. Our first chakra represents our contact with the Earth, our grounding and our ability to materialize practical issues in life without fear and hesitation. It is the core of our instinct and our primal energy, one that comes from our animalistic nature and the firm foundation we have on planet Earth. This energy center is represented by Mars and its raw energy. It is a life force without guidance or conscious understanding, until we learn to work with it, use it for our benefit, and make progress on a material plane as our pathways are clear and we become productive members of our surroundings. The color of this chakra fits the traditional color ruled by Mars and even the color of the planet itself. The seat of kundalini, this symbolism connects well with the role Mars has as one of Scorpio’s rulers, being our first barricade and connection to rivers of ancestors that lived on this planet just so we would get born. The blockage of Mars and its challenging aspects speak of fear and existential crisis, as well as our inability to focus on the goal we wish to reach with pure and obvious intent. The second, sacral chakra is seen in the symbolism of Venus, in both its roles – as the ruler of earthly Taurus to bring satisfaction, and as the ruler of Libra to bring balance. It speaks of our ability to enjoy life, enjoy sexuality, and in general, feel the benefits of the material world around us through pleasure, flexibility and movement. This is the point of perfect balance meant to attract and evoke love, physical pleasure and relationships that bring joy and fun moments into our world. It is the first contact with feminine where our instincts might get sidetracked if we don’t feel adequate or if we care for others more than we care for ourselves. A place of criticism and a potential imbalance of personal value, where one cannot see their actual deeds clearly and balance them out with confidence. The second chakra is in tune with orange color, differing from traditional astrological interpretations but worth some experimenting with in our everyday life. The main problem with Venus is guilt, and when deeply wounded, it speaks of bruises caused to life itself, of undesired pregnancies, love stories gone wrong, things we feel we don’t deserve, and lack of emotional support and motivation for real manifestations of love in all its productive glory. 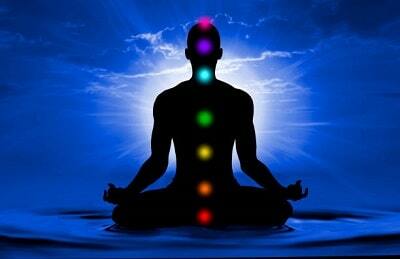 Our third chakra represents our first grounding energetic center where creativity, awareness and ego are to blossom. This is the center ruled by the Sun, yellow, bright and bringing the light of our authentic personality into the world. Here, we recognize others with respect and admiration or see them as those “below us”. Willpower is to be cleansed through the burning fire of the masculine principle carried here, for this is the energetic drive forwards through life, where we are able to create something incredible, as humans, aware and talented to follow our path. However, all religions and spiritual teachings speak of the fall of the Sun so that the Sun might rise, the fall of ego, the fall of life, of man, and this center could bring a lot of problems even when the Sun is strong, set in Leo and without other planets challenging it. The main problem blocking this energy center is shame, known to tear down our energetic walls to make us vulnerable for choices that are self-destructive when we are tied to the image we wish to present instead of freely following our inner child. Our heart is ruled by the Moon, its joyous, childlike purity of connecting and intimate, most fragile matters of emotional flow. The heart chakra represents the passive feminine, the Divine Mother meant to heal and mend all the differences and oppositions in the outer world through its tides. This is the central chakra in our body just as the Moon is the most personal among personal entities in one’s chart due to its speed and proximity to Earth. Its effects are deeply felt in our lives, and the heart chakra is our first line of interaction and defense where we gather experiences however hurtful or joyous they might be. When its energies are in a balanced flow, we gather our gifts from the outer world, metabolize them through awareness of the Sun on a personal level (what this means for me) and give our healthy, unblocked response from the throat and our fifth chakra. Hence, the Moon serves as the balancing point of manipura and vishuddha. The main problem of the Moon is sorrow and when our emotions are blocked, we tend to get stuck in sadness, not letting it out, identifying our authentic Self with it, until we cannot connect with others or feel at all anymore. To cleanse the heart, we must let ourselves feel and embrace our vulnerability as our true source of strength. The throat chakra is in direct relation to our little trickster Mercury, speaking of the way we express ourselves in the world around us. It is a place where our emotions are to be spoken of freely, no matter the price, so that our bodies and our truth can cleanse. Not only is this the archetype where we are meant to be free to express our inner truth and authentic opinions and attitudes, it is also the point where we seek professional fulfillment in the outer world and connect with our human tribe through constructive dialogues. This center asks for movement so our experiences can change and our circumstances inspire the mental processes that connect us to higher spheres of existence and the Higher Mind. It stands for our ability to interact, to listen just as much as we speak, and to cleanse the connection between heart and mind in both silence and high volume. When Mercury is blocked, one feels the need to hide or lie to others, camouflaging their truth, speaking too much or too little, unable to talk about their needs and cravings of the inner, most authentic personality. This center may separate the mind from the heart, leading to numerous misunderstandings and attitudes about others that aren’t based on actual contact of Souls but on ego, prejudice, and unfounded rational judgment. Our sixth chakra is governed by Jupiter and is meant to show us the way, bring visions, precognition, awareness of possibilities in our future, and expand our horizons until our perspective brings us joy. It is the center of knowledge and a point where we rely on information that should come from the heart, to gather our thoughts and feel the mission we were meant to follow. Jupiter brings lucid dreams our way, the feeling of purpose and unity with the universal flow of emotion, and shows how we are to travel through the path of our lifetime to be joyous and content with our moral choices and relationships we create. It is the point of truth in our cognitive world, and speaks of subconscious mechanisms that bring clarity and haziness through more or less emotionally founded beliefs we inherited from our ancestors. When challenged and bruised, Jupiter blurs the image, takes away the purpose, vision and our sense of direction, and holds us spinning in mental loops that don’t allow us to see beauty in situations that brought trauma, left us scarred and all those that we see as pointless and unsynchronized with our convictions about the world and humankind. The seventh energy center located on the top of our head is the crown chakra, ruled by Saturn as our final frontier and our link to worlds expanding outside of our body and limitations of our family tree. This is a chakra that incorporated the Soul into the body in the beginning of it all, and a founding point of faith in all of us, where contact with spirit guides and understanding of our time here on Earth is of the essence. Just like Saturn speaks of the right timing, this chakra is to give us peace with all circumstances out of our control, carrying knowledge that we are under a much larger force, standing above our head with a map, a larger plan, that we must give into without resistance. It requires solitude, meditation, prayer, silence and focus on listening to inner voices, allowing us time for rest and relaxation that will lead to acceptance of our true role in the world even if we don’t fully understand it. Troubles with Saturn will push us on the quest to find God, this ultimately turning to our personal responsibility and boundaries that need to find their healthy manifestation, separated from guilt, judgment and fear. Chakras that belong to the realm of the physical body are presented with planets to Saturn, those that can be seen with a naked eye. Out-of-body energy centers will connect us to the collective consciousness and show through transcendental entities that speak of the way we were dipped in the rest of humankind. Once our primal chakras are aligned, these outer energies will spontaneously be brought to balance and affect all people around us. The stable, clear flow of energy through the Sun and Mercury (the third and fifth chakras) will bring clarity to Uranus too, the energy center right above our head. Venus and Jupiter will circle together to show that all beauty is truth and all truth is beauty, speaking of Neptune and its high, spiritual collective frequencies above those of Uranus. Mars and Saturn, our greatest challenge of the unconscious and karmic issues, will allow us to live Heaven on Earth through the role of Pluto and the energy center under the ground, beneath our feet.